Buying a Business in Spain. A Guide from Britannia Estates. Once you have selected a property, buying a business in Spain with Britannia Estates is a simple procedure. Buying a Business in Spain – A Guide from Britannia Estates. Firstly you will need to take sound legal advice before proceeding. You can appoint your own Solicitor or use the one we recommend, he is an English speaking Spanish Gestoria (Solicitor) who specialises in Business Transfers. His advise totally free with Britannia and you only pay the transfer costs and licence fees these are normally between 1,000€ to 1,500€. The Solicitor will discuss with you the actual costs involved so there are no hidden surprises later on in the transaction. You can then safely enter into a Reservation Contract with the seller. You will be asked to place a holding deposit of 10% or 4,000 Euros whichever is the greater. The Business will be removed from the market and reserved for you. The contract will state the completion date, which we will have negotiated to suit your convenience. This will give you plenty of time to return to your native country to put your affairs in order before your move to Spain and to transfer the balance of the funds prior to completion. During your absence Britannia in conjunction with your Solicitor will conduct searches for any outstanding unpaid bills or debts on the Business to ensure a trouble free completion. In the case of Leasehold property we will also negotiate a new lease contract with the owner. This contract will be checked for legality prior to you signing at completion together with an inventory of all fixtures and fitting as agreed by the seller. On the completion day prior to signing, the inventory is checked to ensure all the items are to your satisfaction. The completion can then take place, monies transferred to the seller, new contracts signed and you receive the keys to your business. Your Solicitor will then start the business transfer process, arrange for a Spanish Resident Permit and in the case of Bar and Restaurant owners a food handling certificate, required by Spanish law. You can open immediately, your Solicitor will have applied for the Solicitud de Licencia de Apertura (opening licence application). 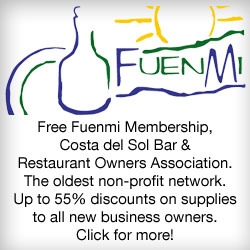 We introduce you to suppliers and even get you a free membership to FUENMI Bar & Restaurant Owners Association who, obtain you huge discounts on your stock, advertising and accountancy fees. We introduce you to other local business owners, who will also trade advice and help you settle in. Your Solicitor will also have the Electricity and Water contracts transferred into your name to avoid any disconnection. We recommend Barclays Bank who, have English speaking staff to assist you. Britannia can introduce you personally. Most of our clients require rental accommodation initially. Our rental department will find you suitable housing for your family needs. This we try to obtain for you to co-inside with your completion. If you have children of school age, we will arrange and attend with you a meeting at the nearest local public school in your area. Public schools are free in Spain you only pay for the child´s books and uniform if worn. There are many Private schools, fees are charged depending on age. We can research these upon request. The purchase of a leasehold property is an excellent way to acquire a business at a minimum cost, without the huge outlay to purchase the Freehold. A Lease transfer in Spain is called a Traspaso. The term of the lease can be between 5 and 30 years depending on the existing contract and a monthly rent is agreed. The contract you sign `Contrato de Arrendamiento´ will state the term, the amount and the conditions. You will be responsible for the payment of Electricity, Water, internal repairs and insuring the business to include public liability. The landlord is responsible for external repairs and any major structural work. At the end of the lease it can be renewed provided the monthly payments have been regular and you have kept within the terms of the lease. You have the right to sell the business within the term of the lease at the price you wish. The lease is a legal contract and as such is governed by Spanish law. If, you or the landlord have a dispute, either party can take legal action in the local court of law. In Spain the freehold rights are the same as all countries in Europe. You own the property as stated in the title deed `Escritura de Compraventa´. You have the right to use, lease or rent. The legal and transfer fees to purchase a freehold property are usually 10% of the purchase price. When selling, the purchaser pays these fees. We are proud of our reputation as legal Estate Agents and have many satisfied clients who can testify to our professional conduct and honesty. Our multilingual staff are at hand to assist at all times both before and after purchase to ensure your well being. This is why, Britannia Estates have become the number one choice and market leaders in Business Transfer on the Costa del Sol. We look forward to meeting you in sunny Spain!